I have a confession to make: I have a fear of flying. I have not flown in more than 23 years. 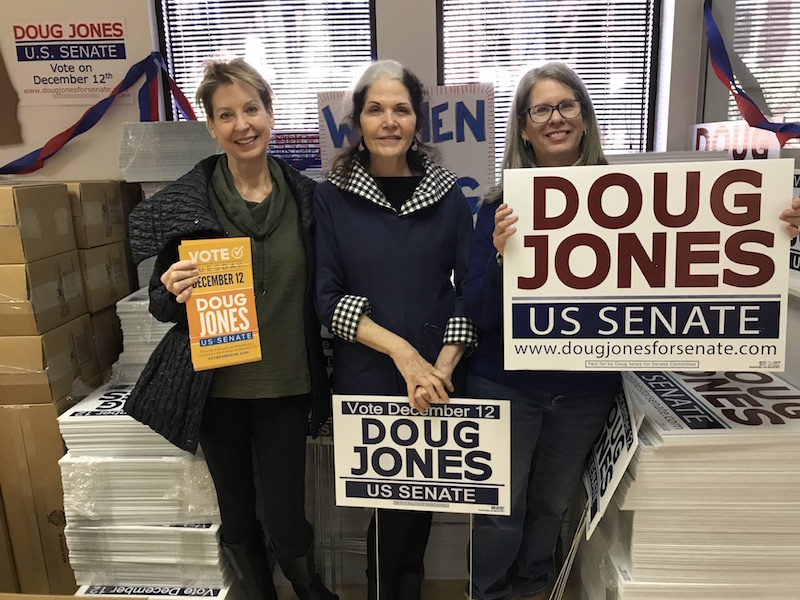 So when the opportunity came my way to help the Doug Jones campaign in my home state of Alabama, I knew the time had come to get over it. You see, I have a bigger, more pressing fear looming over me, the distinct possibility of our country losing its democracy. It is something we have unintentionally and unconsciously taken for granted for a very, very long time. It is an ideology we have assumed had rock-solid protection from our rock-solid institutions: Wrong. Another confession: The concept of “fight or flight” has been rumbling around in my soul for over a year. Do I stay in this country or do I go? I don’t know yet. Do I, selfishly, look the other way and hope for the best? No. Do I think some heroic politician will ride up on his or her white horse and save us all from the destruction we are witnessing before our very eyes? No. Do I think we citizens, and I mean all of us, can save our democracy, our country, and ourselves? Yes. I also believe this: Many of us feel our one vote doesn’t count, we are helpless, alone and unimportant in the grand scheme of things. We are not, and especially when we join together, we are powerful. Hell, I’m not so sure Doug Jones would have won had I not gone to Alabama and brought his campaign some good ole blue Massachusetts juju! LOL. This movement is like an electrical current, gracefully snaking through our country. It is focused, it is powerful, it is determined. Its goals: to preserve our most precious commodities; our democracy, our right to vote, and our right to the truth. So I sucked up my fear and rode that current via a plane to Alabama, in a snowstorm no less. I surprisingly had not one ounce of fear. I figured if the plane went down, at least I had gone down swinging. But not only that, I had to get there; my Alabama needed me. After arriving in Huntsville (my hometown), I spent most of my waking hours working at Mr. Jones’ headquarters. I canvased everyday (called door-knocking) and the afternoon of Election Day, I “poll watched,” which is exactly what it sounds like: You go to the polling precinct and watch. You call the campaign headquarters every half-hour with information about the turnout of your designated precinct — how many voters are there, how long the lines are, whether people are leaving because of the length of the lines. Volunteers then rush over to your precinct with water, candy bars, and cookies, hopefully to keep the voters from leaving. This is all done anonymously, of course. And, this is comforting, there are specially trained lawyers stationed at some of the precincts to make sure every eligible voter gets to vote. I was assigned Precinct 2. I fancied it being in some smart, progressive part of town, full of the cool new breed of Alabamian I was sure existed. What the hell did I know? I hadn’t been there in years. Well, the God of my choosing did know, and had another plan for me. Precinct 2, I soon found out, is in an extremely poor part of town, with a very small voter registration (only 1,586 voters, 60 percent black, 40 percent white), and is a known low-voter-turnout precinct. The highest total turnout in its history was 500, during Obama’s last presidential election. Once I got there and got the lay of the land, I thought maybe I had ticked somebody off back at the headquarters. At first, all the ladies working there were a little skeptical of me. Who was this strange woman dressed all in black with no discernable southern accent? They loved my hair, so that pretty much broke the ice. After a few hours, they were all sharing their Pringles with me while we watched “The Young and the Restless” on one of their laptops during a lull. I’d say “She’s still on?” They’d fill me in on the missing years (I was once a fan). In this special election, my little Precinct 2 had a 450-voter turnout. The majority of the voters showing up were black. Obviously I was in Jones territory. Yahoo! I was making bets with some of the people working there that we’d get 500, but the number we got was a record for this kind of event. The volunteers at the headquarters may have been mad at me (all in my silly head, of course) but my God was not, because what I walked away with from my first poll watch was this: The glaring lack of “giving a damn” our elected officials have for their most vulnerable constituents is galling. I pretty much knew this, but to see it up close and personal was heartbreaking. The people I saw in this precinct that the heavens above plopped me down into were hard-working Americans. I could tell by their clothes, I could tell by the weary looks they wore on their faces. But they came, they came out and voted, and that gave me hope, hope for all of us. So, not only did I get the satisfaction of seeing “my guy” win, there was the added bonus of spending three days with my two high school “besties.” I also got to meet the wonderful new men in their lives, who upon arrival gently warned me, “Lorraine, don’t get your expectations up.” They were just being kind, and did not want me to be disappointed. So, it was very rewarding late election night to give them both big, fat, but good-natured “I told you so’s.” See, what I knew, and what they didn’t know, was all the grassroots work that had been going on down there. What a night, what a win it was for all of us, and I had a front-row seat. And that is because I had put my fears aside. I had gotten on that flight. I went to that fight, and I helped beat the bad guy. Right now, just for now, I cannot imagine anything feeling better than that.